The link between neck pain and technology use. Neck pain is becoming more prevalent in recent times and much of it is linked to the poor postures we adopt when using technology. On average, we spend 15 hours a week in front of a screen (almost 1 month of the year), and up to 50 hours a week if it is required for work. When using technology, our eyes need to be in an optimal position to focus on the screen. For most of us, it is easiest to poke our chin out to get closer to the screen. For each inch that your head sits forward of its normal position, the head adds 4.5kg of force onto the small and fragile structures within your neck. All of this added pressure can cause neck pain, shoulder pain, arm pain and headaches from the muscles in your neck having to work harder and the added pressure placed on the discs, nerves and vertebrae. If you are someone who spends a lot of your hours in front of the screen, behind the wheel or on the couch, there are some strategies that you can adopt to ease the pressure on your poor neck! Your deep neck flexors are muscles in front of the spine responsible for neck stability (similar to the role of the deep abdominals in your lumbar spine) and supporting the head directly over the spine. 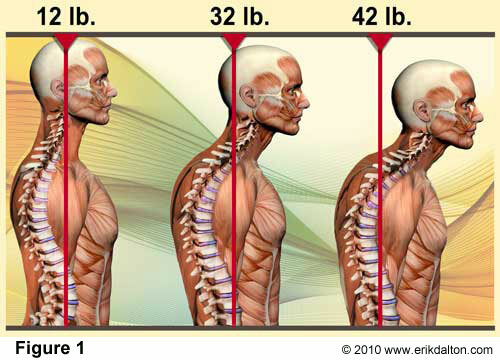 When your neck is over your spine, the pressure on other parts of your neck and body will be reduced. Step 1 – Lie down on your back with a pillow underneath your head and neck, legs bent up and muscles relaxed. Step 2 – Tuck your chin in so it feels as though it is lightly blocking your windpipe and push the back of your skull into the pillow. Do NOT activate the muscles at the front of your neck. Place your fingers on these muscles if necessary to stop them from activating. Step 3 – Hold this position for 5 seconds before relaxing. Repeat 10 times before having a rest, then complete 1-4 more sets of 10 until fatigued. When in the car, use the head rest and tuck your chin in. When at your desk or when using technology, make sure you are not protruding your chin to see the screen. And, when you are sitting on the couch make sure your head is in a good position and is supported appropriately. Move the items in your environment (screen, mouse, keyboard, chair) so that you can maintain a good posture and still work efficiently. 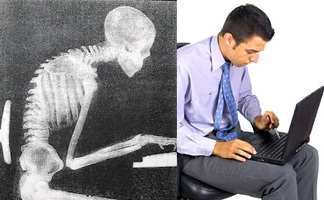 Laptops and tablets force poor posture as looking down at the screen and typing so close prevents good posture. Purchasing a wireless keyboard to use with your tablet to separate hands and screen, increase the font size on your smartphone, correct the angle of your screen on your laptop and position pillows properly when sitting on the couch to provide low back support..
Increasing the amount of time that the structures in your neck are under pressure will increase the likelihood of developing pain. Scheduling regular breaks will allow your neck to have a rest and to relieve the strain. If you do suffer from neck pain due to poor posture, these strategies will help you. Poor posture, however, is not the only cause of neck pain and if pain persists we do recommend consulting your physiotherapist for a full assessment. The “Achilles Heel” of runners!! 5 tips to help remedy Achilles tendon pain. Whether you are a professional marathon runner or simply enjoy a recreational jog it is likely that you have experienced pain in the Achilles tendon at some point. The pain will generally be most prominent during warm-up, settle down significantly as you run only to return with a vengeance after you have cooled down after running! 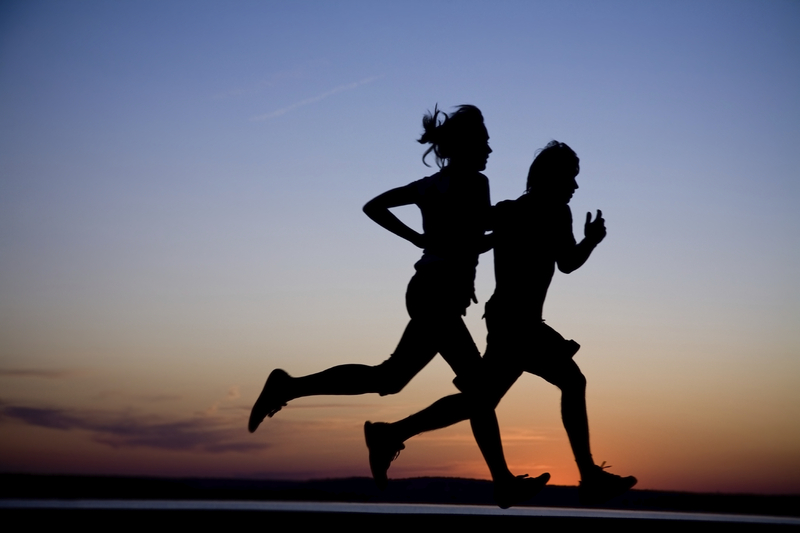 If it continues to worsen, it can become very debilitating and prevent from running altogether! This article will help to arm you with the anatomical information and practical knowledge necessary to help recognise Achilles tendon pain and how to manage it! Firstly, it is important that you know the anatomy of your Achilles! 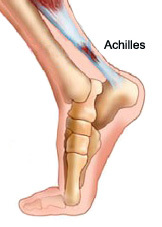 The Achilles tendon joins the calf muscle to the heel bone. Tendons are a soft tissue structure made up of the elastic material called collagen and always attach muscles to bone. 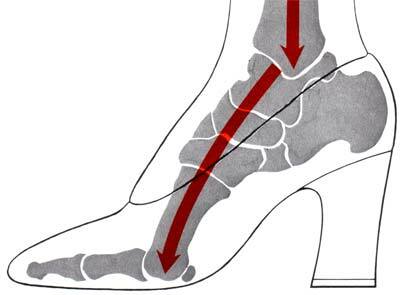 The role of the Achilles tendon is to transfer the power produced by your calf muscles through to the heel bone to move the ankle joint and provide you with forwards thrust as you run. Pain in this area can be as a result of tendonitis (inflammation of the tendon) or tearing. It can sometimes start very suddenly after a big load through the tendon, such as falling into a pothole as you run. More commonly, pain in the Achilles develops a gradually over time as a result of overuse and worsens unless managed appropriately. Get some professional advice from a physiotherapist. There are a number of important exercises that can be done to improve your tendon pain and get you back to running ASAP!! Love them or loathe them high heels have a marked effect on how a woman stands and moves and most men will know that these effects can often be quite alluring. By lifting the heel the buttock muscles have to work harder and in doing so appear more pert. The shift in weight means the chest is pushed forwards thereby enhancing breast lines. The general awkwardness of the revised gait means that swings, sways and jiggles are introduced that tend to attract extra attention. 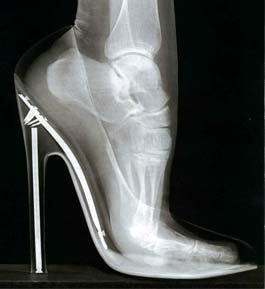 as can be seen in the X-ray of a foot in high heels, there are other factors to consider that not only cause pain during and after wearing, but can also cause long term damage. 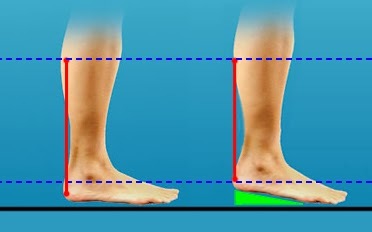 The pressure on the Metatarsals (the long bones just behind the toes or balls of the feet) is increased enormously. This increased pressure increases the risk of the development of a ‘Morton’s Neuroma’, (nerve aggravation between the metatarsals) which develops into a nerve growth. 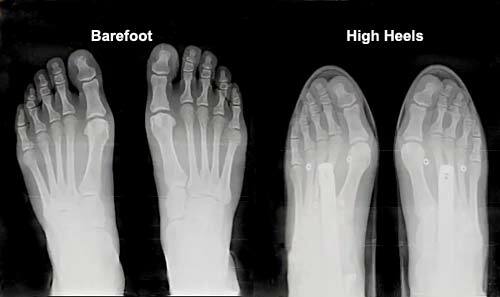 If you compare the ultimate healthy state of barefeet it is easy to see how the toes are pushed together to fit into the ‘glamorous’ narrow shoe, increasing the likelihood of Bunion formation ( Hallus valgus) and an overall cramping and deformation of the foot results. 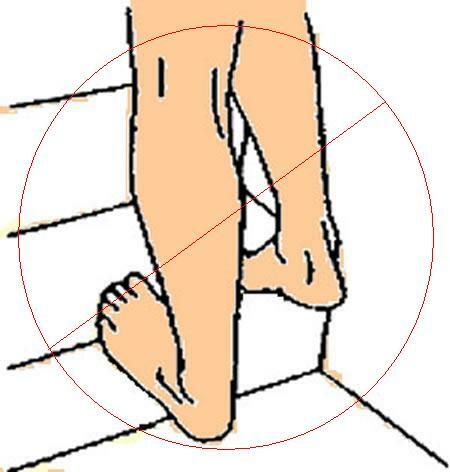 The Achilles Tendon is shortened and prolonged wearing will cause permanent change which in turn changes the foot ankle dynamics and increase risk of ankle sprain and tendon damage. The increased arch often affects the lower spine, increasing joint pressure that can cause episodes of back pain and instability. So…. a physio’s advice (who has been known to wear high heels herself from time to time) is to keep the really high heels for very special occasions! Choose lower heels when you can. Keep this in mind when shopping girls!! After a night in heels spend a few days in flats – or even barefeet if you can. If heels are part of the work attire, wear flats to and from work and slip on the glam’ professional look only when necessary. Girls… remember it was a man who designed high heels and back in the times when men did wear heels they were not 15cm high and definitely not stilettos but wedges which are a more stable option!!! Gardening can be the most restorative of activities – unless we overdo it, and most people will be guilty of that at some time or other. The key is to not go at it like a bull at a gate, but to pace yourself (regardless of your age) and pause during repetitive tasks to let joints and muscles rest. Every fifteen minutes is a good target but don’t leave it more than half an hour before RESTING and performing the OPPOSITE movement for a short while. Extended pruning with secateurs is a classic cause of RSI (repetitive strain injury). Just pause now and then to stretch your fingers, hands and wrists in the opposite direction to the pruning action. Joints will recover, muscles will shed their fatigue and you’ll be more efficient. 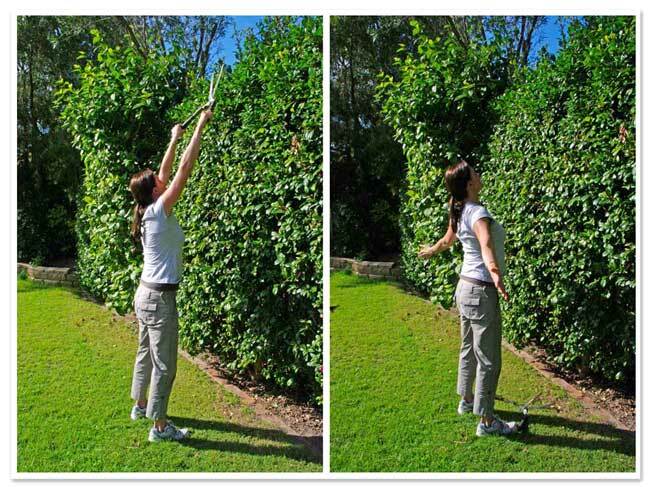 While pruning or clipping overhead your shoulders will take most of the strain. Just pause for a few moments and roll your shoulders down and back in a circular motion for one minute. Apart from providing rest for the muscles, you’ll also relieve those joints and tendons temporarily. Remain standing tall during the exercise and keep your chin in. While digging, raking or bending to weed, stop and arch your spine and shoulders backwards with hands pushing your pelvis forwards. It’s a classic for very good reason as it allows the gelatinous content of squashed discs to revert to balance again. I see so many patients suffering from lower back pain from gardening, yet this small exercise can prevent so much discomfort. Many gardening tasks involve kneeling and even if you’re wearing kneepads to protect the front of your knees, the knee joint and surrounding tendons needs rest and opposite action too. So stand up and give them a rub and a wiggle (that’s a technical term for repetitive re-traction by the way). Many mature gardeners will suffer some occasional joint pain, whether it be arthritic or rheumatic and many will avoid outdoor activities at these times. But all joints benefit from movement as it stimulates joint lubrication which in turn provides the nutrition for the joint linings and cuffs. People who immobilise tetchy joints do themselves no favours as the joint will become stiff and produce even more pain. If you have painful joints and decide to do some gardening then warming up first is all the more important as this will minimise the initial discomfort. But, as with all things to do with health, all movements should be performed in moderation. Stop if sharp pain persists and consult a doctor.